These are gluten free pancakes that provide complex carbs and some protein for a healthy breakfast. Breakfast pancakes of the fluffy type are more of an American way of making them, Europeans love their crepes, the thin and crisp ones. 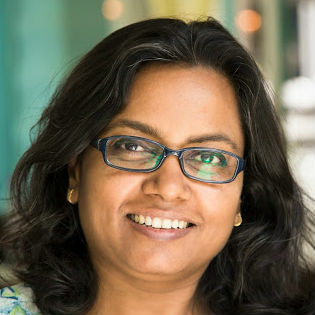 We Indians make a few thin and crisp crepes in savory and sweet variety as well, but there are a few hearty pancakes made with whole wheat too. Those thicker Indian pancakes are not fluffy types, more on the soft inside-crisp outside variety. 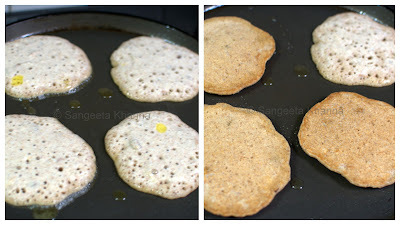 One Gud wale cheeley (jaggery-wholewheat pancakes)I have posted in the past and another desi wholewheat pancakes with molasses I posted as a guest post sometime ago. I think I have posted quite a lot of pancakes on my other blog as well, the reason being the husband who can have pancakes even for dinner. I am not a pancake person at all, a sweet meal can make me sick of sugar for a whole week. I make my savory pancakes for myself. Talking of savory pancakes, I have posted one with Buckwheat as well, Zucchini pancakes with buckwheat that is a favorite way of having our meals during fasting days of Navratri. 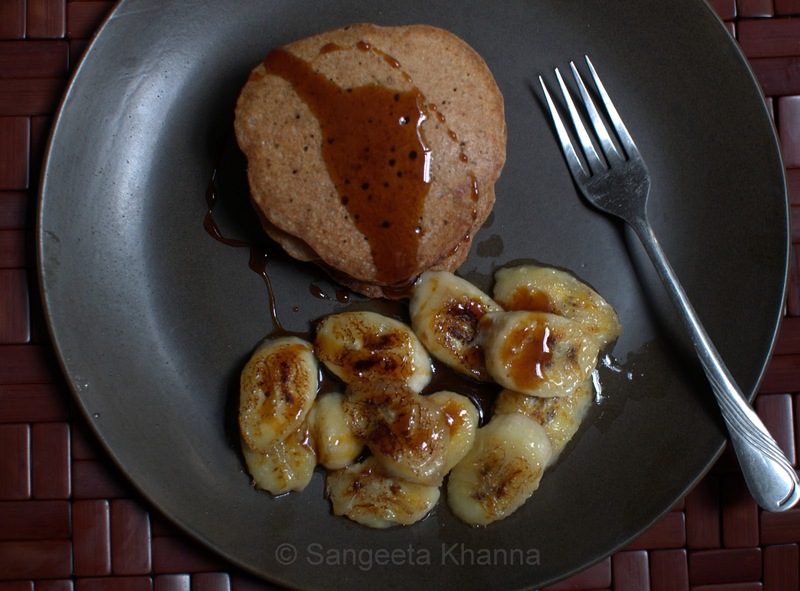 This fruity sweet buckwheat pancake is also suitable of fasting days, makes a nice vrat ka khana recipe. Nothing fancy, a batter made with buttermilk and made into pancakes that takes just about 20 minutes if you are making them for one or two people. Using a dosa griddle helps as you can make about 4-5 pancakes at a time. Add the buttermilk to the buckwheat flour in a deep bowl and keep whisking all this while. The batter should make a flowing thick consistency. Add the soda bi carb and salt to it and then heat a griddle or flat base frying pan to make the pancakes. Drop a small ladle-full on the hot and greased griddle and let it spread by it's own. Repeat the process to make more pancakes in the empty space on the griddle. Within a couple of minutes you would see air bubbles appearing on top and then the base of the pancake becomes firm. It takes about 2-3 minutes to cook on the other side as well. Remove all the pancakes from the griddle and repeat making more pancakes till the batter is over. 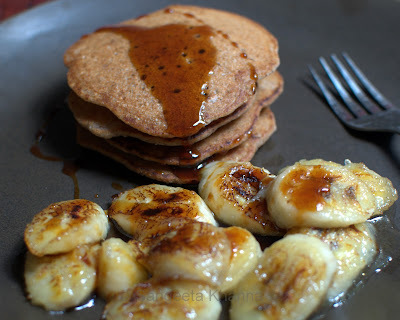 Chop the peeled banana over the same hot griddle which is greased after shallow frying the pancakes and let the slices get caramelised, turn them to get brownish both sides and serve it on the sides or on top of the pancakes, drizzled with date syrup, honey or maple syrup. Arvind likes his pancakes very lightly sweetened and I always add a pinch of salt to the pancake batter so the sweetness of the syrup is more enhanced. These are perfectly crisp outside and firm soft inside, the soft mushy banana slices make a nice accompaniment to this hearty buckwheat pancake. Pancake looks nice and is a healthy option too.